The Australian professional pest management industry is currently undergoing fundamental changes as a result of regulatory, consumer and technological influences. Professionalism in business and adherence to quality standards are areas that the pest manager of today needs to embrace in order to ensure success in the future. 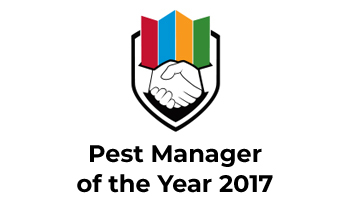 Pest Manager of the Year is owned, organised and run by AEPMA to promote the wider pest management industry. The Award is for the best pest manager business; not for an individual’s or a technician’s contribution to the industry. We Would like to thank BASF and AEPMA for awarding Australian Pest Specialists the prestigious 2017 Australian Pest Manager of the Year. Our team have worked long and hard over the last 12 months to ensure our customers received a professional and quality service. The team at Australian Pest Specialists are focused on the long term benefit for our clients, the environment and our customers. We promote local community involvement and sponsor a number of local causes. Our strategy over the last 18 months has been to set ourselves apart from the other companies providing Pest Services. We have focused on positioning ourselves as a customer service business that provided a valuable service to our customers in the pest control industry. We have worked on our quality, service guarantees, and reasonable pricing structures, and we continually explore what exceptional customer service and experience really means. Receiving the title of Pest Management Company in Australia shows that we are on the right track. The Award is recognition from our industry – for helping raise the service standards in an industry that for the most part, can have a negative reputation. The aim of the Award is to promote the professionalism of the pest management industry to the public and other stakeholders, highlight the professional pest management industry to the public, grow the professional pest management industry; and encourage learning and increased professionalism of the pest management industry. We would like to acknowledge our customers for their loyal support and encourage those who have not used our services in the past to give our company an opportunity to protect their assets and homes in the future.